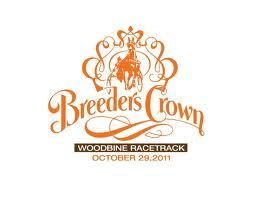 The Grand Circuit season is not over but it is all down hill after the next two weeks as the best of 12 divisions meet at Woodbine for Breeders Crown eliminations (Oct. 21 and 22nd) and finals (Oct. 29). From Indiana Downs on Saturday, Oct. 22, come four sires stakes (INSS) finals at $200,000 each. TwinSpires offers 10X points on that card, so click here for those details. We offer our suggestions for the INSS miles below. Continue in the next two weeks to check out our exclusive blog, Breeders Crown Countdown because we will be collecting all the inside information and then on the two nights of elims and one for finals we will be reporting on TwinSpires live with reports via the blog and Twitter in exclusive cooperation with the event’s handlers, the Hambletonian Society. On the site at Woodbine we have sources (horsemen) giving us up-to-the-minute news about the entries, the track condition, et al. There is nowhere else but TwinSpires to truly experience the Breeders Crown, so lock and load those accounts and let’s get into the thick of the races for Friday and Saturday. First, here are the races that will not be part of the elim-weekend agenda. 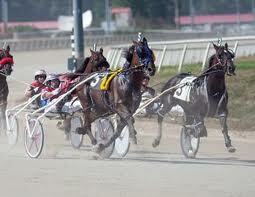 Three events go straight to finals: The two-year-old filly pace, the Open Trot and Open Pace. As of press time, the Mare Trot “is under dispute and in limbo,” according to officials. Friday’s eliminations are all for two-year-olds. No freshmen are allowed to supplement, so these five races feature colts and fillies that have been eligible all season. Frosh-colt trotters start it off in splits worth $25,000 (U.S.). Eight go to post and one of them is a horse we hit on two times in a row ($18 and $13) streaking at The Red Mile. It’s From Above, trainer Greg Peck’s 2012 Hambletonian hopeful. This time around he may not offer such value, though a lot of money will go to Possess The Will after his record performance in Kentucky. The outside contender with a similar style as both of those but who will not be bet to the hilt is Classic Conway. The New York-bred has a good gait and may be peaking right now. The other colt-trot chapter presents some shaky stuff. These are very green boys and it is difficult to predict which will hop, skip or jump, no less trot to victory. The fascinating outsider here could be Appomattox. The Frank Antonacci-trained colt is one of two maidens in this field. Yet, he has excuses for his losses and was bet the best of his career when he trotted home second to From Above two races back. He could win by default or just because he is coming up to this race ready to do better than ever. The single frosh-filly trot elim is as contentious as a face for youngsters as has ever been put on a racetrack. Circles and Win Missy B are byes for the final, leaving 10 to contest eight spots in the elim. Still, what a mess of talent taking step on the track. We have raised support for many of these gals over the course of the season but it is now time to find the one that can spread some black ink into our accounts. That gal, it seems, is Personal Style. Her win at 49-1 in Kentucky was a massive overlook on the part of the public. She should have been given a shot off of a vet scratch and a break during a good performance but the crowd showed no mercy. Tonight, considering the popularity of Miss Paris and Check Me Out, “Style” may again go off a long price. Richard Norman’s filly will race better than an outsider and maybe go better than the recent win. Two frosh-colt pace elims line up to reach for the final in Race 4 and Race 6 to complete the Friday Crown lineup. Continued support for A Rocknroll Dance is bound to dominate the win pool as this colt tries to put his pace in his sire’s hoof beats. But this may be the perfect time to wager against him as he comes off a sub-1:50 mile. Hurrikane Kingcole has had two blistering qualifiers, one in 1:53.2 on a good Pocono-five-eighths track, as tune ups for this week and next. He will be winging and he will be worth it on the toteboard. The second split, Machapelo sits in a perfect spot to use the force he showed winning a Champlain Stakes. The son of speedy Mach Three may be the best of this group if his blueblood begins to flow as he heads for a promising sophomore campaign. Two elims for each of the sophomore gaits and sexes are on the agenda Saturday, Oct. 22. Filly trotters start the evening in Race 1 and it is a matter of who stays flat that makes this first mile so difficult. Which will the public trust this time? We think it is time for Jezzy to show what she can do. She is certainly the most trustworthy on gait and she is bound to be overlooked enough to make her a good investment. Race 2 presents the first split for the glamour-boy trotters. Two supplements, Daylon Magician and Dejarmbro, take on some familiar and unfamiliar members of the division’s regular crew. This is class warfare, with the “fresh meat” coming from cheaper affairs. Chapter Seven returned to decent form and has the style to win here over the supplements, who should share favoritism. For the second filly trot we have to give a shot to Pantholops. If she stays flat she could take off as she did when we had her at the Meadows at 16-1. She is the sharp outsider and classiest of the bunch. Race 7 is the first mile for filly pacers. We have to love Swinging Beauty for the probable overlay she will be. Her style is perfect for Woodbine and she could pace down Drop The Ball as Strike An Attitude did in the last battle of these babes. Race 9 marks the return of See You At Peelers, the sentimental favorite and one-time queen of this division. If her heart is better she will race well but only well enough to make the final, we think. We’re sticking with Rocklamation, who was tough in the Jugette and has the reserved style to do well in Woodbine’s sinking stretch, which leaves a lot of speed short. The glamour-boy pacers cap the night with Race 10 and Race 11. The Teague team has been hot and Custard The Dragon breathed fire in a qualifier at Pocono to ready for this fray. He always wins when the odds are against him and this could be a big mile for him at juicy odds. Finally, Fashion Delight has been primed and preened for this event and may give everything he has to at least win this elim and do so at strong odds against the crowd-pleasing favorites who have lacked being the threats that their odds have portrayed. Action in the Midwest, where TwinSpires offers 10X points on the Indiana Downs card this Saturday night, begins with a frosh-filly trotter INSS final. Under the radar here, My Sweet Sheila could upset the obvious favorites for driver/trainer Robert Taylor. 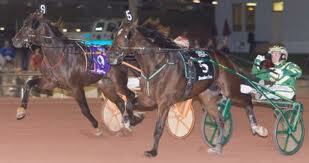 The two-year-old colt trot champ may very well turn out to be the weirdly named Velten San Siro. He has collected many big checks in only nine outs. Free Girl is in a good spot to charge home first in the frosh-filly pace final. Her sire, LCB (named after the Pennsylvania Liquor Control Board) was solid in the East when racing and turning into a productive sire in the Midwest. Fritz Bow has won half of his first campaign’s races and was close most the others. For only eight starts he may just be starting to wake up enough to win the frosh-colt pace final.